Berkery Noyes Represents Excelsior Software In Its Sale To KUE Digital - Berkery, Noyes & Co., LLC. February 5, 2008, NEW YORK, NY — Berkery Noyes, the leading independent investment bank serving the education, information and technology markets, announced Excelsior Software, LLC (“Excelsior” or “the Company”), a leading provider of classroom assessment management software, has been acquired by KUE Digital Inc., a leading global education company. The terms of the transaction were not disclosed. “The K-12 market realizes the need for an integrated instructional and assessment solution” said Chris Curran, the Berkery Noyes Managing Director who advised Excelsior on the transaction. 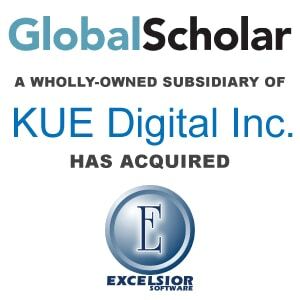 “Tying together Excelsior’s assessment solutions with GlobalScholar’s online tutoring platform establishes a strong strategic position within the educational technology segment,” Curran added. “Our solutions raise student achievement by providing immediate access to performance information, increasing teacher productivity and improving communication between all those that are involved in a child’s learning environment,” said William Zaggle, Excelsior’s CEO and Co-Founder. “Now we have the ability to provide customers with a solution geared towards addressing the instructional needs for every child,” added Zaggle. Berkery Noyes acted as Excelsior’s exclusive financial advisor and represented it in its negotiations with KUE Digital Inc.
About Excelsior Software– Founded in 1986, Excelsior Software is a developer and marketer of leading classroom formative/summative collection and reporting management software. Excelsior offers the highest level of responsibility to understand its customers with a focus on innovation, quality, and product intelligence and improving communication between students and educators. Excelsior has been instrumental in developing a market specifically around electronic gradebook solutions for teachers, and it has been successfully serving elementary, middle and high school parents, teachers, and administrators with its product offering. For more information, visit www.excelsiorsoftware.com. About Berkery Noyes– Berkery Noyes is one of the pre-eminent merger and acquisition firms serving the education and information industry, having completed more than 400 transactions since its inception. Among the most recent transactions completed by Berkery Noyes are the acquisition of Interwrite Learning by eInstruction, eInstruction in its sale to Leeds Equity Partners, Monotype in its transaction with Calvert Street Capital Partners, Psychological Services, Inc. (PSI), in its transaction with ABRY Partners, The Teaching Company in its sale to Brentwood Associates, the sale of ELLIS to Pearson, Questar Educational Systems, Inc. by TASA, The Hampton Brown Company by National Geographic, Delta Education LLC by School Specialty, Inc, ProQuest Company’s acquisition of Voyager Expanded Learning, the sale of Facts on File to Veronis Suhler Stevenson, the sale of Kurzweil Educational Systems to Cambium Learning, and Dominie Press to Pearson Inc.
Berkery Noyes’ clients include private companies seeking a buyer, most of the major international information companies, and private equity firms who use the firm’s expertise in locating, analyzing and negotiating with acquisition candidates and in managing divestitures. The firm operates with a staff of forty professionals serving the information and publishing industry. For more information, visit www.berkerynoyes.com. About GlobalScholar– GlobalScholar, a wholly-owned subsidiary of KUE Digital, part of the Knowledge Universe family of companies, offers a unique online tutoring platform, where parents and students can safely connect with trusted educators who provide one-on-one tutoring, homework help, or self-paced learning. The GlobalScholar platform also can be used by schools and school districts to enable teachers and administrators to more efficiently and effectively create, manage, and align content, assessments, curriculum, standards and supplemental learning to drive educational performance. GlobalScholar also provides educational information to students, parents, and teachers at www.collegefinder.globalscholar.com and www.schoolfinder.globalscholar.com. For more information, visit www.globalscholar.com. Buyer Parent: Knowledge Universe, Inc.